Ms. G in Grade 3 was sweet enough to nominate me for the Versatile Blogger Award. I want to give a BIG shot out to Ms. G, because she is an amazing blogger with many, many great ideas! Thank you SO much for the award! 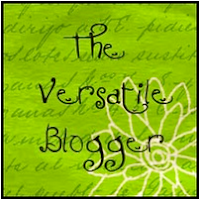 There are some stipulations and rules for the Versatile Blogger Award. 4) Give seven random facts about yourself. I have recently started making spinach shakes (banana, nutella, vanilla yogurt, and lots of spinach). They are delicious and great for you! My boyfriend and I recently moved from an old house to a brand new apartment, and love it! I secretly think it would be really cool to departmentalize--I don't even care which subjects I would teach! I used to have 5 classroom pets! That's right--FIVE! Some were on loan from my students, but we had a hedgehog (Scared the crap out of me! ), a rabbit, a hamster, and the only two pets that belong to me: two tree frogs. I really want a pet dog for my classroom. I think that would be the coolest. We no longer have satellite, so I watch Parks and Recreation repeatedly. I've probably seen all the episodes 4 times. My favorite children's book is Horray for Diffendoofer Day by Dr. Suess. Also, I am trying to add more to my TN store and TPT store for Word Work. Look for a blog on it later today or tomorrow.